Five area institutions came together under the National Endowment for the Humanities plan for “Creating Humanities Communities” to work together on a project that would help each individually while benefiting the community at large. Marlboro College acts as fiscal sponsor and provides scholars and the raw energy of students. The Brattleboro Historical Society brings the experience of working with students on historical podcasts as well as expertise and archives. 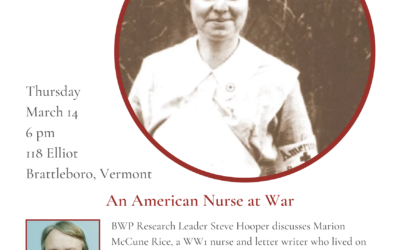 Write Action has engaged with a number of writers working cooperatively with Editor Jeff Potter for a heritage book entitled Brattleboro: A Print Town. The Brattleboro Literary Festival brings a robust annual event at which to feature little-known literary giants of the area. Brooks Memorial Library bring myriad resources, a public audio “Story Booth” and equipment/software, special collections, and exhibition space. Marlboro College, a small liberal arts school approximately ten miles outside of Brattleboro, is the fiscal sponsor of the Project. Faculty including Meg Mott, Kate Radcliffe, Amer Latif, Adam Franklin-Lyons, Amy Beecher and others will work with teachers to develop curriculum and interact in classrooms and with research groups to illuminate study sites through their particular humanities lens, and participate in public events in order to build relationships in the community. William Edelglass, Professor of Philosophy, is the lead academic and a key Project founder who serves on the Project Leadership team. Marlboro benefits by using Brattleboro and surrounding towns as place-based research labs and increasing awareness of its important collections. The project benefits from potential support from Marlboro’s area alumni network and student support on shaping the audio tours, website, exhibition, and other Project products. teacher at BAMS. Over the past few years, Joe and BHS board member Reggie Martell, both of whom serve on the Project Leadership Team, have to date made 170 podcasts. They air Thursday mornings as part of Green Mountain Mornings radio program. BHS looks forward to expanding on the success of this work, especially sharing this successful teaching model with other area schools, working in conjunction with the larger Project. writers in the classroom, and helping write audio text for the tours. The Project will enhance Write Action’s visibility in the community and help raise community interest in supporting a printing museum at one of the sites to be studied. Board members Arlene Distler and Rolf Parker participate in the Project Leadership Team. The Brattleboro Literary Festival is a three-day annual festival held in mid-October, founded in 2002. Over the years, the Festival has presented over 500 authors of all genres and ages, including winners of the Pulitzer Prize, National Book Award, and others. Festival-goers, which number more than 4000 each year, have wanted more information about the town’s literary history, which is one of many reasons the Festival is excited about this Project. Board members Sandy Rouse and Jerry Carbone serve on the Project Leadership Team. Organizers feel the Project will enhance the festival’s ability to respond to public demand by increasing its reach and interaction with surrounding communities, especially children and students. The Festival will mount special exhibitions and programming on local literary figures each October as part of the Project. 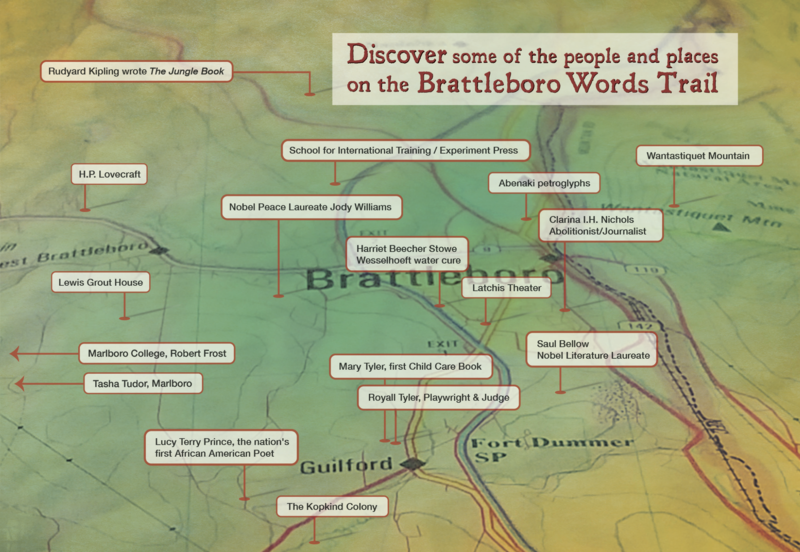 where Project participants can contribute their own audio to the Brattleboro Words Trail. Students from area elementary and high schools will also be coming to Brooks for research trainings, and some Roundtables and other public talks will happen there. Library Director Starr LaTronica and Research Librarian Jeanne Walsh serve on the Project Leadership Team.